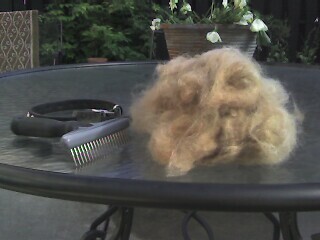 Three days after the giant fur wad, I brushed this pile out of my dog. I could’ve gotten more too if he hadn’t been so interested in those stupid squirrels. Also in the picture is the rake that I use to brush him. Mark Hayward Is My Hero is powered by	WordPress 5.1.1 and delivered to you in 0.478 seconds using 39 queries.